De Brack was a French officer who participated in several military campaigns of Napoleon and who obtained the Legion of Honor for his conduct in the battle of Wagram (5-6 July 1809). From 1807 till 1812 he was member of the 7th Hussars and from 1812 till 1815 he served in the 2nd Lancers of the Guard (the famous Red Lancers). After the defeat of Napoleon he went to Brazil and returned to France in 1830. In 1831 he published his ‘Avant-postes de cavalerie légère’, translated into English by Major Lonsdale A. Hale and Captain F.T. Hobson as ‘Light cavalry out-posts’. This work, a real treasure trove on various kind of military subjects, was reprinted several times and was still in use in the Second World War (Roucaud, 2007). His famous book is written in the platonic tradition of question and answer, though it is certainly not a theoretical consideration on the art of war, because de Brack himself was a man of action who knew what he was writing about. “ as a general rule only deliver cuts when the enemy is in front of or alongside you. “(de Brack, , 1876, p. 51). “at the level of the neck, because it is natural for a horseman attacked to lower his head, and thus you strike him in the face; if your blow fails, it hits the shoulder or forearm, and places him hors de combat.” (de Brack, , 1876, p. 51). “Every cutting edge is a saw, more or less fine, which produces its effect only by moving horizontally on the object it is used against. To produce this effect at the moment you strike, draw back the hand to the rear; therein lies the secret of the terrible sabre cuts of the Mamelukes.” (de Brack, , 1876, p. 52). “Under the Empire, the cavalry did not carry a hatchet, and the sword was used instead of it, for purposes of the bivouac; the blade and edge consequently were soon in a bad condition; but the troopers, who understood their business, soon found a remedy for this unavoidable abuse of their weapon: 1st, by only using the lower part of the blade in cutting wood, pickets, etc. and thus keeping the upper part in good order for the fight; 2nd, by always carrying with them a small very soft file, with which they sharpened the blade when it had lost its edge. “(de Brack, , 1876, p. 53). “General rule; take as much care of the blade of your sword as of the blade of your razor. “(de Brack, , 1876, p. 55). To conclude this brief description of four valuable works concerning the use of the saber in the army of Napoleon, I have added the treatise of Christmann and Pfeffinger: Theoretisch-Praktische Anleitung des Hau und Stossfechtens und des Schwadronhauens nach einer ganz neuen Methode bearbeitet (Theoretical-practical instructions for fencing with cuts and thrusts and against multiple opponents according to a completely new method). The only biographical information about Christmann can be found in the introduction of his book, written by Pfeffinger. Christmann was born in Germany (ein geborner Mainzer), professor in the art of fencing (professor der fechtkunst), member of the French fencing academy in Boulogne and several other German academies. He fought in the Garde Impérial (the elite corps of Napoleon) and participated in many battles (viele Feldzüge) (Christmann, 1838, p. III). Unfortunately this is the only information we have about the military career of Christmann. Pfeffinger also adds that Christmann has a lot of experience and taught his method to many students. Christmann: Theoretisch-Praktische Anleitung des Hau und Stossfechtens (1838), plate 1. After studying under many masters, Christmann developed his own method (in collaboration with Pfeffinger) and according to Christopher Amberger, the centerpiece of this method is “the changing of the line of attack” (Amberger, 2008). In the introduction to the book, Pfeffinger writes that their system is primarily meant for soldiers of the German army (Christmann, 1831, p. V), wether they have to face one or multiple opponents (Christmann, 1831, p. V-VI). In the work of Christmann, we can see different combat situations where the saber is facing different other weapons such as the bayonet and even the lance of a mounted cavalrist. In the picture on the left Christmann gives a description of the different hilts, the protective gear, the target zones and also of the different kind of sabers. He also adds some interesting ‘Bartitsu-like’ situations where civilians, armed with sticks or unarmed, have to defend themselves against (un)armed ruffians. Christmann: Theoretisch-Praktische Anleitung des Hau und Stossfechtens (1838), plate 10. Christmann: Theoretisch-Praktische Anleitung des Hau und Stossfechtens (1838), plate 9. But the treatise of Christmann is not only written for combat, but it also deals with the use of the saber as a a way of physical exercise, in this way it is very helpful for young people to make them healthier, stronger and take away their possible apathy to turn them in people who are proud on their nation and have self confidence (Christmann, 1831, p. VII-IX). These ideas about the physical advantage of training with the saber are elaborated in the introduction (Christmann, 1831, p. 1-25) in this way Christmann puts a huge emphasis on the sportive aspect of the saber! For people who only want to focus on the sportive aspect, it is possible to fence only with the so called ‘legal’ techniques, but Christmann adds that he has also included illegal techniques for the soldier who wishes to hit his opponent by all possible means. Of course it is possible for people who only want to use legal techniques, to skip the illegal ones, however it is good to know illegal and legal techniques. Further, Christmann gives the advice for people who want to fence without protection only to use cuts and no thrusts (Christmann, 1831, p. 26-27). Christmann: Theoretisch-Praktische Anleitung des Hau und Stossfechtens (1838), plate 6. After this second introduction, the reader still has to wait before the lessons in the saber arte starting. First he has to go through another theoretical part (Chapter 2) on the kind of sabers, the parts of the saber, protective gear, fencing with the stick, the position of the body, distance between fencers, target zones,… and even how to greet with the saber. After this introduction the actual lessons start, which are remarkable because of their very systematical approach to fencing. Without any doubt, the book of Christmann is one of the most systematical and elaborated treatises on saber fencing, combining both the sportive and the martial aspect of fencing with the saber! To become cavalry officer, Louis Rilliet went to the cavalry school of Saint Germain-en-Laye (near Paris), where he studied for three to four years with about 600 students. The teaching staff included four teachers of mathematics, four of history-geography, two teachers of literature, two of military admininistration,… and two fencing masters (Rilliet, , 2013, p. 6). Fencing match in French camp 1813-1815 by Aleksander Zauerveid. Generals and soldiers are observing a fencing match between two soldiers. Both of the fencers are wearing fencing masks, their sleeves are rolled up and they are not wearing their uniforms. It is not clear how frequent these lessons were and probably most of the soldiers learned how to deal with their sabers from the experience they obtained during the military campaigns. Joseph Abbeel who had some experience with horses in his homeland became member of the carabiniers and is very brief about his military training. When he arrived in the military barracks of Lunéville (France) in september 1806, he received his uniform and learned to walk in miltary parades on foot and on horseback. On the fourth day he was already challenged to a duel and though he never had a saber in his hands, he didn’t refuse the challenge and this was enough for his adversary who claimed he only wanted to test the bravery of Abbeel. In february 1807 (so after nearly three months of training) the carabineers had to leave to go on campaign, because they “now already had some experience in horseriding and using weapons” (my translation of Welten and De Wilde, 2011, p. 13. ). When he and his comrades arrived in Bad-Freienwalde (near Berlin) he received some more instruction and that is the last thing Abbeel writes about his training in the use of weapons. “I have often seen troopers sprain their wrist, and be disabled for a whole campaing from having given a thrust awkwardly; it is easy to understand this, since they oppose only their fore arm to the whole force of the weight and speed of a mounted man. If they had drawn back the arm they would not have been hurt and would have been ready either to renew the attack or to return to the guard. “(de Brack, , 1876, p. 52). In this way, the dragonne (lanyard or wrist strap) was very handy: a soldier could release his sword after the impact after it had done its deadly work, without actually losing the weapon. The straight blade was advised for the heavy cavalry as cuirassiers and carabiniers, while the lighter cavalry used the curved saber (Haythornthwaite, 2002b, p. 28). Both of these weapons were carried in an iron scabbard. Haythornthwaite: Napoleonic cavalry (2002), p. 31. The curved blade was perhaps easier to use, and with some training it could also be used to thrust. On the other side, and as illustrated by several examples further in this text, it was much easier to survive a cutting wound. Light cavalry saber (An. XI-pattern, known as the ‘chasseur-sabre’) and iron scabbard, made at Klingenthal: this was the weapon of the light cavalry, Hussars, Lancers, Chasseurs à Cheval. This saber has a weight of 1,21 kg (the scabbard weights about 1,3 kg) and a blade of 87 cm. Most cavalry blades were kept in iron scabbards, which had a bad influence on the sharpness of the edge and could even cause rusting. On the other side: leather scabbards were too expensive to make and less sturdy (Haythornthwaite, 2002b, p. 28). Most edges were probably not sharp enough to cut of limbs as a whole and they were certainly not razor sharp. Still, they could have a terrible power, as sergeant Bourgogne tells about his sergeant-major who was involved in a duel and whose head was cut from front till chin (Cottyn and Hénault, ,1910, p. 334). All French soldiers are clearly carrying mameluke swords on this painting. Even before the first Mamelukes entered Europe, their reputation was already spread through France and their clothing and weapons were imitated. “These mamelukes are excellent horsemen, they can do with their horses whatever they want. With their curved saber, they can cut off a head in just one blow, and with their sharp stirrups they cut the flanks of soldiers” (Larchey, ,1883, p. 473). Though the mamelukes in the Battle of Austerlitz served under the French flag, they originally were fearsome enemies of the French when they fought with them in the Egyptian campaign of Napoleon (1798-1799). The French were so impressed by them, that they made them a small but impressive part of their army. They never actually counted more than 150 soldiers, though later even Europeans could become member of their regiment, so their numbers increased. The French admired the flamboyant clothing of the mamelukes, their bravery in battle and imitated the Mameluke way of oriental clothing and… sabers (Pawly and Courcelle, 2006, p. 8-9, 15-16)! Even the infantry of Napoleon’s army carried sabers (called briquet), in the beginning it was worn by all grenadiers and light infantry, but later it was limited to sub-officers, grenadiers, carabineers and rummers by the imperial decree of 7 October 1807. The weapon was 75 cm long, including 15 cm for the hilt. (Crowdy, 2015, p. 101). Similar to the cavalry sabers the briquet was also decorated with a dragonne. The rounded hand guard made the saber very similar to a tinder striker, hence it was mockingly called ‘briquet’ (a sort of metal blade to strike against flints to make fire). Crowdy, Napoleon’s infantry handbook (2015), p. 101. The usual weapon for infantry officers was the spontoon (espontoon). In regulations from 1779, one can read that this weapon had a blade of about 70 cm, not meant for cutting or parrying but mainly for thrusting. From 1790 onwards, the saber became more popular, probably because the officers wanted to imitate the light cavalry officers (Crowdy, 2015, p. 102). Officially duelling was not permitted in the French army, but in reality it was also not really forbidden and even extremely popular… In 1792 an edict stated that it was forbidden to draw swords within the walls of a fortress, so actually it was acceptable to fight outside of the walls of the garrison or encampment (Crowdy, 2015, p. 155). The example of the 5th Hussars regiment clearly shows why the army staff didn’t encourage duelling: in this regiment about eleven soldiers and sub officers died as a result of duelling between 1793 and 1810, in the period between 1796 and 1813 duelling wounds caused 19 soldiers and sub officers to be un unable to perform their duties (Massoni, 2008, p. 229). Nevertheless and in spite of strong moral condemnations of duelling (as by Barrère in the Moniteur 183 of 2 July 1791), duelling wasn’t even mentioned in the French national law and there was certainly no specific law against it (Briost, Drévillon, Serna, 2002, p. 462-463). According to Cohen “courts tended to act only when a fatality resulted from a breach of established etiquette” (Cohen, 2010, p. 97). Duels between soldiers indeed had certain rules of etiquette: after an official challenge, the details were arranged between the offended parties with the assistance of ‘seconds’. These seconds agreed on time and place and they could even act as mediators when one of the parties wanted a way of reconciliation. It was also the seconds who mediated about the choice of weapons: pistols or sabers. The choice for pistols was usually influenced by an injury of one of the duellists, which caused him not to be able to fight with an edged weapon so he had to choose for a distance weapon as the pistol (Crowdy, 2015, p. 155). Usually duellists fought naked to the waist (or with open shirt), so they were unable to wear hidden protective mail under their shirts. This mail was sometimes even coloured in flesh colour (called ‘supersticerie’), to hide it even better (Cohen, 2010, p. 97). Parquin and Malet are about to duel. Parquin, Récits de guerre (, 1892), p. 107. 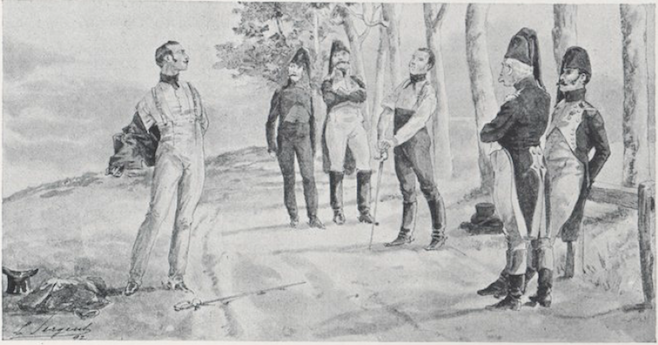 A fine example of etiquette between duellists can be found in the memoires of captain Parquin (1786-1845) who was involved in a duel with smallswords: his first thrust was deflected by the buckle of the suspenders of Malet, his opponent, and made him bleed slightly. For Parquin’s opponent, this was not a real wound, so he wanted to continue the fight. After several exchanges and driving back his adversary, Parquin manages to give him a thrust in the right side, which causes Malet to fall down. Immediately Parquin runs to Malet to help him and even asks his own seconds to help his brave adversary. Together they bring Malet to the army surgeon who tells them that the wounded Malet is going to survive his wound without any problem (Parquin, (, 1892, p. 106-108). Dominique Larrey (see infra) mentions several cases of soldiers whom he treated after they had fought in duels. One soldier had his forearm amputated because Larrey feared the soldier would get infected with gangrene (Larrey, , 2004, I, p. 455). In one case Larrey dedicates several pages to describe the treatment and healing process of the arm wound of Pierre Cadrieux, who was injured in a duel. Not one bad word is said about the origin of the wound, Larrey seems very enthusiastic to describe the complex arm wound and how he could heal it, it is even used as an interesting case in the Medical School of Paris ((Larrey, , 2004, II, p. 896-901). Several French officers had a history of duelling: Pierre Augereau (1757-1816), son of a Parisian fruit-seller, fencing master, officer of Napoleon who started as a common soldier was a famous duellist. He had the reputation of a champion swordsman and had to flee the army after killing an officer in a quarrel. During this travelling life, he worked as a fencing master and even taught dancing, until he returned to the army in 1792 when deserters received amnesty from the government. In the army of napoleon he became a famous commander, known for his bravery and meticulous clothing and apperance (Haythornthwaite, 2001, p. 10-11). The most famous duel between two Frenchmen during the Napoleontic time is the famous duel between Fournier Sarlovèze (1773-1827) and an officer named Dupont. Sarlovèze was known as the ‘demon of the Grande Armée’ and loved challenging civilians to duel with him, but he became legendary because of a long series of duels which lasted from 1794 to 1813 (Elting, 1997, p. 174). Finally, Dupont wanted to stop this stupid behaviour – he was about to marry- and challenged Fournier to a pistol duel. Fournier wasted his two shots and was delivered to the mercy of Dupont who still had two bullets left which made Fournier eternally in debt to Dupont and thus a long series of duelling (lasting almost 20 years) was ended (Elting, 1997, p. 694). Bert Gevaert did a PhD in classical philology (disability in ancient Rome), is teacher of Latin in a secondary school, lecturer on historical subjects and city guide in Brugge. He started historical fencing in 2007, participated on his first tournament at Arts of Mars (2010), became second in SwordFish (2011), king (champion) of his guild, Hallebardiers (2011) and obtained a place in the quarter finals in Swordfish (2012). He practices armoured combat, longsword, dussacken and recently (September 2012) also rappier, mainly focussing on authors of the 16th century with a preference for Joachim Meyer and Hector Paulus Mair. Bert is currently finishing a translation of Heinrich von Gunterrodt, De Veris-Principiis-Artis-Dimicatoriae, which is going to be published at Freelance Academy Press (ebook in 2014 and printed edition in 2015). He has also translated the longsword section of Hector Paulus Mair into Dutch and is currently working on an English translation and comment (based on the Codex Icon 393) together with Keith Farrell. Besides this he is also working on a Dutch book on HEMA (14th till 17th century) and a book on the history of the guild of the Hallebardiers. In September 2013 he started a class of wrestling and dagger, based on Fiore dei Liberi, especially for secondary school students. Fascinating article Bert, well researched and well presented. This is great context for our understanding of all those military saber manuals everyone has been looking at, because sabers are so fun. Now I really need to buy an antique saber, I just have to figure out how can I rationalize the cost to my wife!